My wife and I went to a grocery store to do some shopping yesterday. 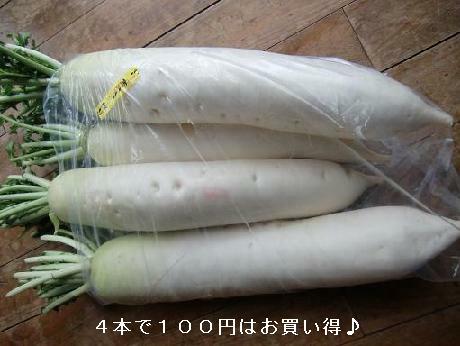 We found a pack of four radishes for 100 yen there. The store sold them as a loss leader. They were selling like hot cakes. We bought one without hesitation. It's reasonable, isn't it ? Ａ　I saw bibinba on TV yesterday. He was holding a lot of radishes in hands. Ｂ　He certainly　is a ham actor ! I will make a beeline for Melbourne !